Brighton & Hove Albion fought back from two goals down to beat Millwall on penalties in the FA Cup quarter-final on Sunday afternoon. After a turgid first half, Millwall found the breakthrough midway through the second as the hosts took the lead at a corner, when defender Alex Pearce ghosted in at the back post to power home a header. The Lions went two up in the 78th minute, as Jed Wallace nipped his way past two defenders on the right wing, before picking out Aiden O'Brien in the penalty area, who fired home a clinical finish. Jürgen Locadia then pulled the scores level with a fine finish, before Solly March's free-kick took the game to extra time. 90: GOOOOOOAAAAALLLL! OH MY WORD!!!! Deep into extra time, Shane Ferguson was sent off for a stamp on Lewis Dunk. Neither side was able to find a winning goal, and the game went to penalties. Glenn Murray hit the bar for Brighton first up, before Shaun Williams slotted home to put his side ahead in the shootout. Locadia then put his side level, but Ryan Tunnicliffe put Lions back in-front with a ruthless spot kick. March levelled it up, before Ryan Leonard saw his side regain the lead. Davy Pröpper once again made it all square, but Mahlon Romeo's strike was superbly stopped by Matthew Ryan. Dale Stephen's stepped up for the Seagulls and gave his side the advantage, but Steve Morison also scored to take it to sudden death. It's been a rather miserable season from ​Millwall in the ​Championship, and the side stand a good chance of being relegated back down to League One, after a dismal run of form culminating in five straight losses in a row (before Wednesday's big win over Birmingham City). In the FA Cup, however, they've looked a different side, claiming big scalps such as ​Everton and Hull City on their way to the quarter-final. As was to be expected, The Den's cauldron-like atmosphere was at its formidable best for the game - as the Lions faithful roared their plucky side on against Chris Hughton's side. From the off, Millwall took the game to their opponents, with top goalscorer Lee Gregory and tenacious midfielder Wallace causing the ​Seagulls' back-line some real problems. They also defended boldly when required, and frustrated their opponents as they looked to spring counter-attacks at every opportunity. After the break, with the fans rejuvenated and back in stirring vocal form, Millwall resumed their spirited approach to the game, and were rewarded with a brace of goals. However, their lack of top level composure showed late on, as they conceded two goals in five minutes to see the game go to extra time. In the end, the magic of the Cup didn't deliver at the shootout, but it was certainly an afternoon of football the Lions faithful won't forget in a hurry! The 24-year-old was the standout player of the match, after tearing the Seagulls' defence to shreds throughout the ninety minutes. The former England U19 international surged down the right wing with brazen ferocity, embarrassing Brighton full-back Bernardo by consistently catching him out of position. He was highly unlucky not to score himself, as Ryan's point blank save denied him early on in the second half, but his assist to give his side the lead was exquisite. 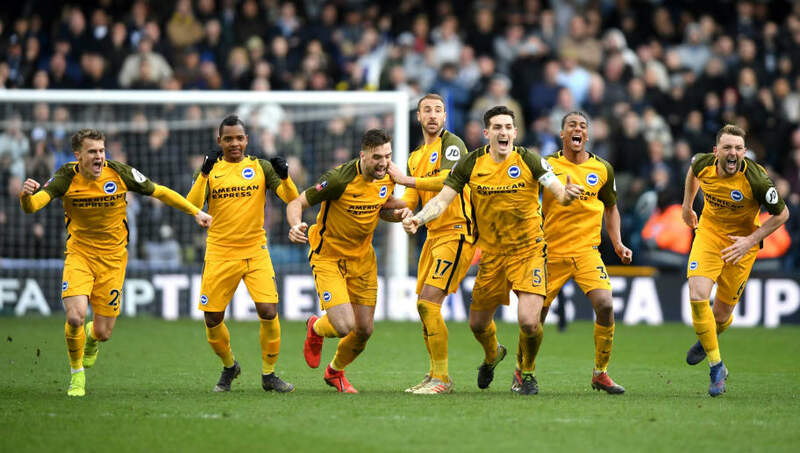 Brighton have come on leaps and bounds in recent times, consolidating their Premier League status and playing some entertaining football along the way. With the side into their second season back in the top tier, their clash against Millwall seemed like an ideal opportunity for the south coast side to show their pedigree against their former contemporaries. The Seagulls weathered the expected early storm, and absorbed the pressure from their opponents before countering when they had the opportunity. However, as the hailstones hammered down in the second half, they failed to assert their authority on the game, and were caught napping at a set-piece, allowing the hosts to score the opening goal. They failed on the defence front again late on for the second goal, but showed great character to pull a goal back, and then send the away support into raptures with the late equaliser. Certainly, they got away with one here, but full credit to Brighton for digging in and earning that shootout win. Sure, he only came on with 20 minutes to go, but his performance changed the course of the game, as he catalysed his side's comeback with both a goal and assist. Of course, there was a certain slice of luck with his goal, as David Martin let the ball fly through his gloves and into the top corner - but a fine cameo nonetheless. After the international break, Millwall travel to Championship high-flyers Leeds United, in what should be a tricky afternoon for Neil Harris' side in their fight for survival.